Last year was one of the most eventful for the Royal family, with the wedding of Prince Harry to Meghan Markle, Princess Eugenie to Jack Brooksbank, and the birth of Prince Louis. And while 2019 won't be as jam-packed for the Windsors, there's a whole new reason to celebrate on the horizon - the birth of the Duke and Duchess of Sussex's first child in the spring. 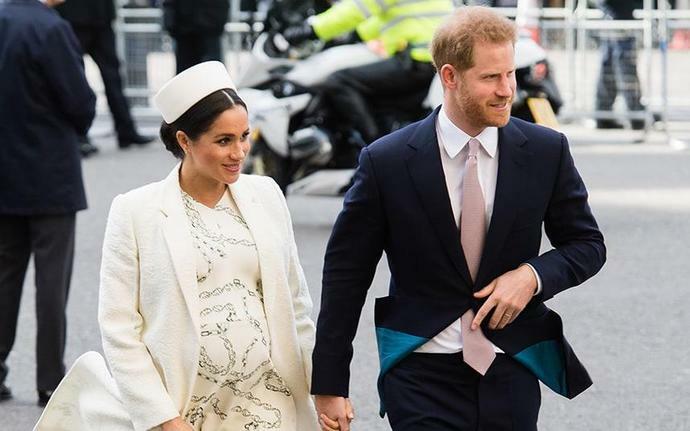 As royal watchers in the UK and abroad wait for the latest arrival, speculation is mounting as to what he or she could be called - and whether the Queen will allow the child to become a Prince or Princess. What names could the couple be considering? The duke and duchess may decide to go with a traditional name like Alice, Mary, Elizabeth or Victoria for a girl or Philip, Frederick, Charles, Arthur, Edward or James for a boy. However, the pair are forward-thinking royals and may decide to surprise everyone when naming their first child. Canadian-born Autumn Phillips, and husband Peter Phillips, opted for a non-traditional name for their daughter Savannah - the Queen's first great-grandchild - in 2010. The Duchess may also seek inspiration from her friends. Her confidante and stylist Jessica Mulroney has twin boys Brian and John, and a daughter Isabel Veronica, who is known as Ivy - who were pageboys and bridesmaid at the royal wedding. Harry and Meghan's child, who will be seventh in line to the throne, is extremely unlikely ever to be king or queen, meaning the couple have more freedom with their choices. In comparison, the Duke and Duchess of Cambridge chose to give their children traditional names, picking George for their firstborn, who is likely to one day be king. One option - considered a favourite for a girl - is Diana, in honour of Harry's mother. William and Kate paid tribute to Diana, Princess of Wales in 2015 by choosing it as one of Charlotte's middle names. Prince Harry was just 12 when the Princess Diana was killed in a car crash in Paris in 1997. Meghan's mother, to whom she is close, is called Doria, and the ex-Suits star may want to pay tribute to her as well. What are the current name odds? The Duke and Duchess of Sussex's baby will not be a prince or a princess unless the Queen steps in. King George V - Harry's great-great-grandfather - limited titles within the royal family in 1917. If the child is a boy, it could instead become Earl of Dumbarton - one of the subsidiary titles the prince received from the Queen on the morning of his wedding. The eldest son and heir apparent of a duke can use one of his father's lesser grade peerage titles by courtesy, according to Debrett's. A daughter could be Lady (first name) Mountbatten-Windsor, and any subsequent sons Lord (first name) Mountbatten-Windsor. The 1st Earl of Dumbarton, George Douglas, was a Scottish nobleman and soldier. He was badly injured in a duel with the duc de Normandie in 1669 and papers reported him dead due to the severity of his injuries.